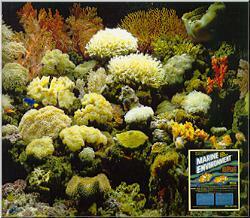 This magnificent 125 gallon reef aquarium is heavily stocked with hard and soft corals. It is illuminated with two 5600ºK, 175 watt metal halide and two actinic lamps. This aquarium is 100% MARINE ENVIRONMENT® dual phase formula. Filtration is a trickle filter with one cu. ft. of Super BI OX® and dual protein skimmers. 25% water changes are performed each four weeks. No additives or supplements are used between water changes. A: The pH of NSW (natural seawater) is usually 8.25 – 8.50. In marine fish and reef aquariums, a pH between 8.2 and 8.5 is acceptable for most animals. If possible, maintain your pH at 8.3. Q: What should the pH be in freshly mixed marine salts? A: A good marine salt will hydrate or mix to a pH of 8.2 – 8.5 within one hour after being mixed with good quality clean fresh water. 15 brands of marine salts were tested for pH in the S-15 Report. Most test samples mixed to a pH over 8.7 one hour after being hydrated in cleionized water. Most hobbyists test kits would be unable to detect and allow for corrections of a dangerous pH marine aquarium situation. Q: What pH do marine salts hydrate to one hour after mixing? A: In alphabetical order test samples averaged: BIO-SEA® 8.4. Coralife® 8.72, Coral Sea 9.4, Deep Ocean 9.67, Forty Fathoms® 9.0, hW Marinemix 9.4, Instant Ocean® 9.0, Kent Salt 8.95 (1) Marine Art (Japan) 8.36, Marine Environment® 8.21. New Ocean 9.06, Red Sea 8.83, Reef Crystals® 8.95, Sera Meersaltz 9.10, Tropic Marin® 9.55, Ultra Marine 9.20.
pH was tested at Anresco Laboratories, Inc. using AOAC procedures and Beckman instruments. Q: Does initial high pH indicate a salt mix will buffer, keep or maintain proper pH? A: No. Initial high pH has nothing to do with the pH holding capabilities of marine salts. pH and ammonia are interrelated. The higher the pH, the more ammonia is in the same solution. High, low, or fluctuating pH is unnatural and can stress captive marine animals unnecessarily. Q: My pH test kit only goes to pH 8.5. How do I test if my marine salt has actually mixed to a higher or unsafe pH? A: Many pH test kits use indicator dyes that are accurate only in a limited pH range. Most liquid dyes and powders (reagents) mixed into solution begin to indicate color at pH 7.7- 7.8. The color deepens as pH goes up. At pH 8.5 and above the color remains unchanged and accurate tests are difficult to obtain.. A pH probe or meter that is properly calibrated can offer more accurate tests from pH 7.6 – 9.8. 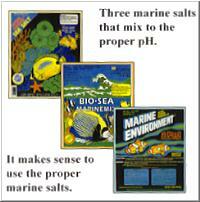 It is best to use marine salts that mix to the proper pH. Avoid high pH problems. Q: Why does the pH go down in a salt water aquarium? What can I do to keep proper pH? A: The decline of pH in a closed marine system is natural. Waste ions build up and the initial buffer in marine salt is exhausted and your aquarium needs a water change and/or the addition of a ‘buffer’. Marine aquariums that are poorly filtered, heavily stocked, overfed and/or receive infrequent water changes drop pH faster. Q: With proper filtration, stocking, feeding, and making routine water changes, what other factors determine how long proper pH is maintained? A: Each brand of marine salt contains some amount of initial buffer. CORAL MARINE, BIO-SEA® & Marine Environment® are three brands of marine salts that have powerful initial buffers, mix to the proper pH and offer good to very good to excellent pH holding capabilities. Q: Will using a ‘buffer’ substitute for making a water change? A: No. Sometimes the words ‘buffer’ or ‘super’ or ‘extra’ are misused and are not understood. Many so called ‘buffers’ are not much more than baking soda (sodium bi-carbonate). This will not maintain a pH of 8.3, even when mixed with tetra-sodium borate. (Borax® like hand cleaner). 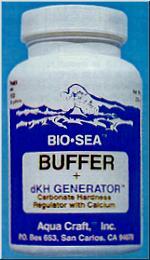 Buffer + dKH Generatoris a true-buffer that will adjust low or high pH to 8.3. This uniform particle size powder also contains a carbonate hardness regulator with calcium. It is one of the best and safest ways to add calcium, regulate carbonate hardness and control pH in all marine fish and reef aquariums.